As demand for wind energy increases, offshore deployments are continuing to move into deeper waters. The University of Maine’s Advanced Structures and Composites Centre has been awarded the first phase of a potential $93.2 million deepwater offshore wind demonstration project by the US Department of Energy (DOE). Vestas has joined the WindFloat Project for floating offshore wind turbine platforms using a semi-submersible structure. DNV KEMA, the energy arm of DNV, believes the new standard will help accelerate the development of a new generation of floating offshore wind turbines by establishing design requirements for the floating structure and related systems. “As demand for wind energy increases, we predict offshore deployments will continue to move into deeper waters and, consequently, there’s a need to establish design standards that will help ensure safety, reliability, and confidence in future wind turbines,” says Johan Sandberg, head of renewable energy at DNV KEMA, Norway. A new standard can increase the confidence in the industry and hopefully attract new investors to this new renewable energy technology. Sandberg notes that many densely populated coastal areas around the world are not suitable for traditional bottom-fixed offshore wind turbines. In other areas, the shallow water coast is already developed or challenging seabed conditions makes bottom-fixed offshore wind unsuitable. Also, local communities have been known to oppose projects due to negative visual impacts. “Recent successful deployments of full-scale prototype configurations have demonstrated that floating wind turbines can be a viable alternative and the market is taking notice," he says. 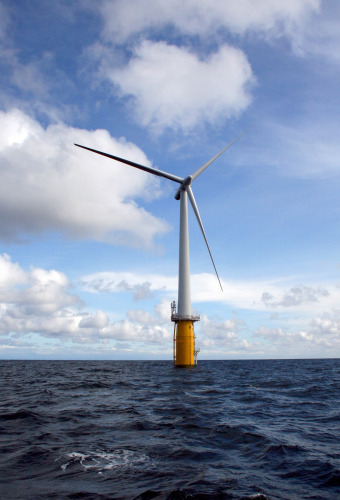 In September 2011, DNV initiated a Joint Industry Project (JIP) for the development of the DNV standard for design of floating wind turbine structures. The new standard is a supplement to the existing DNV-OS-J101. The JIP focuses on floater specific design issues: suitable safety levels, reliability-based calibration of safety factors, global performance stability, station keeping, site conditions in relation to low frequency floater motions, necessary simulation periods, higher order responses and design of floater-specific structural components. The 10 participants in the JIP study are Statoil, Nippon Steel & Sumitomo Metal Corporation, Sasebo Heavy Industries, STX Offshore & Shipbuilding, Navantia, Gamesa, Iberdrola, Alstom Wind, Glosten Associates and Principle Power. For various reasons, countries like Japan and the US have also made offshore wind energy one focus of their energy policy. According to Sandberg a tricky point in the development of offshore wind around the coastal belts of these countries, like the majority of coastal belts around the world, is that water depths can range from dozens to hundreds of metres. This situation demands new technology, so in both Japan and the US ideas are turning to floating structures for wind turbines. “It is now time to take the next step: standardisation," Sandberg explains. "A new standard can increase the confidence in the industry and hopefully attract new investors to this new renewable energy technology." The new standard for floating wind structures supplements the developed DNV Guideline for Offshore Floating Wind Turbine Structures, and the existing standard DNV-OS-J101 Design of Offshore Wind Turbine Structures. It covers a broad range of issues, including safety philosophy and design principles; materials and corrosion protection; structural design; and transport and installation. The VolturnUS 1:8 is a 65 ft tall turbine prototype, 1:8th the scale of a 6 MW, 423 ft rotor diameter design. It is the first floating turbine of its kind in the world, with a unique floating hull and tower design.